Work/Life Balance: Fact or Fiction? 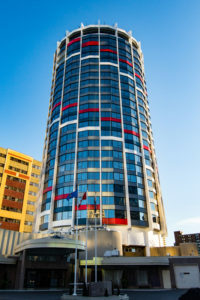 We look forward to welcoming you to Chateau Lacombe Hotel, located in the heart of downtown Edmonton. The hotel is an iconic landmark is conveniently located within walking distance to the river valley, the Arts District, shopping and nightlife. For added convenience, the hotel offers significant downtown parking (additional charges apply). A block of rooms has been reserved for October 27 to October 30, 2019. The Working Stronger 2019 rate will be available until September 28, 2019 or until all rooms are booked, whichever comes first. Reservations for Working Stronger 2019 can be made by individual attendees directly with Chateau Lacombe reservations at 1-800-661-8801 or 780-428-6611 Monday through Friday 8:30 am to 5:00 pm (MST). 5% off Econo* and 10% off EconoFlex and Premium fares for travel within Canada and 2% off Econo*, 5% off EconoFlex and 10% off Premium base fares for guests travelling Trans-border. To take advantage of this offer, you will need the discount code: T25NH22. Please visit www.westjet.com/conventions to make a booking online.